On Thursday, April 18, 2018, the House Agriculture Committee reported its version of the farm bill titled the Agriculture and Nutrition Act of 2018 (House Ag Committee Press Release, April 18, 2018). The vote to report the bill to the full House was 26 to 20 and notable because the vote was partisan; no Democrats voted for it, no Republicans voted against it (Brasher, Agri-Pulse, April 18, 2018). The partisan nature of the committee’s initial steps in reauthorizing the farm bill may signal further difficulties for passing a bill in Congress this year. Significant focus has concentrated on three key changes in the bill; revisions to the Supplemental Nutrition Assistance Program (SNAP), elimination of the Conservation Stewardship Program (CSP) and alterations to farm programs, including payment limitations and eligibility requirements. The following is a brief review of the 2018 House farm bill. 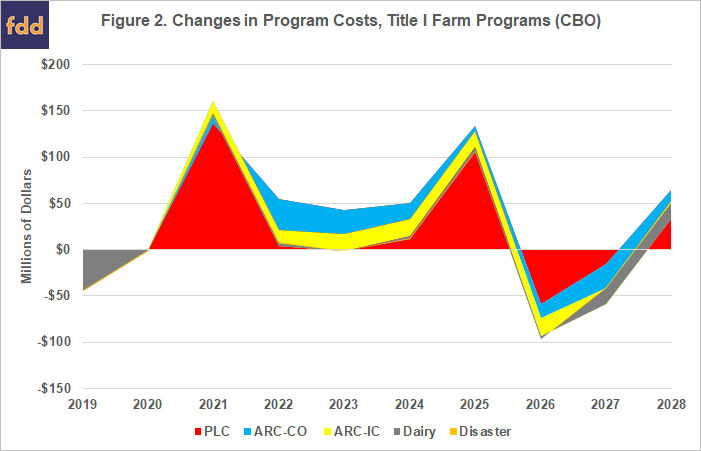 Title I reauthorization in the House Ag Committee farm bill continues the Price Loss Coverage (PLC) program and the Agriculture Risk Coverage (ARC) program, but eliminates the individual option in ARC. The changes are focused on PLC and appear most likely designed to make it a more attractive option than ARC. CBO’s assessment indicates as much, with estimates that PLC will spend an additional $408 million but ARC will spend $254 million less than the baseline expectations; a $111 million reduction in ARC-CO and a $143 million reduction for eliminating ARC-IC. Specifically, the House Ag Committee included a change to PLC that triggers payments based on the effective reference price rather than the statutorily-fixed reference prices. 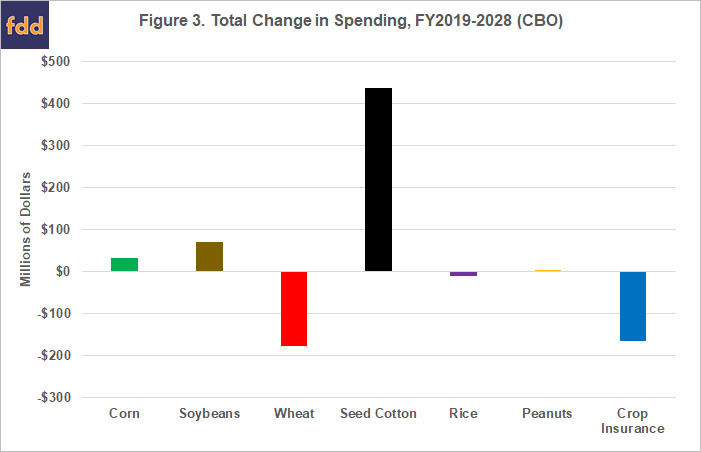 The reference prices fixed in the statute remain unchanged from the 2014 Farm Bill and the Bipartisan Budget Act of 2018 (BBA 2018) that added seed cotton before the House farm bill was released (farmdoc daily, February 14, 2018). The effective reference price is the higher of the statutory reference price or 85% of the five-year Olympic moving average of marketing year average (MYA) prices but capped at 115% of the statutory reference price. The bill also includes an option for farmers that suffered drought during the years 2008 to 2012 to increase payment yields used for calculating PLC payments. For seed cotton, this is in addition to the provision that multiplies the PLC yield for upland cotton by a 2.4 factor. Finally, for those farmers who elect ARC, the crop insurance title prevents them from purchasing area-wide revenue insurance policies. CBO estimates that eliminating CSP will reduce spending by $12.6 billion over ten years. The bill would add $7.7 billion to EQIP, which also includes new authority to provide for 5-to-10-year contract payments for adopting and installing conservation practices, as well as managing, maintaining and improving the stewardship practices. The bill also increases funding for the Agricultural Conservation Easement Program (ACEP) by $2.2 billion, as well as a $1.3 billion increase for the Regional Conservation Partnership Program (RCPP) created by the 2014 Farm Bill. The CRP acreage cap steps up from 25 million acres in 2019 to 29 million acres in 2023 (1 million acres per year) but places limits on the rental rates for acres re-enrolled in the program. In general, rental rates for the initial enrollment of acres in CRP is to be capped at 80% of the estimated annual average county rental rate. Acres reenrolled in the program for the first time are capped at 65%, acres reenrolled for a second time are capped at 55%, acres reenrolled for a third time are capped at 45% and acres reenrolled for a fourth time are capped at 35% of the annual county average rental rates. Based on the CBO score, this appears to have helped reduce the costs of adding acres to the program. Based on the House Ag Committee mark-up, the most controversial aspects of the bill are the numerous changes to the Supplemental Nutrition Assistance Program (SNAP) in the nutrition title (House Ag Committee, Business Meeting, April 18, 2018). 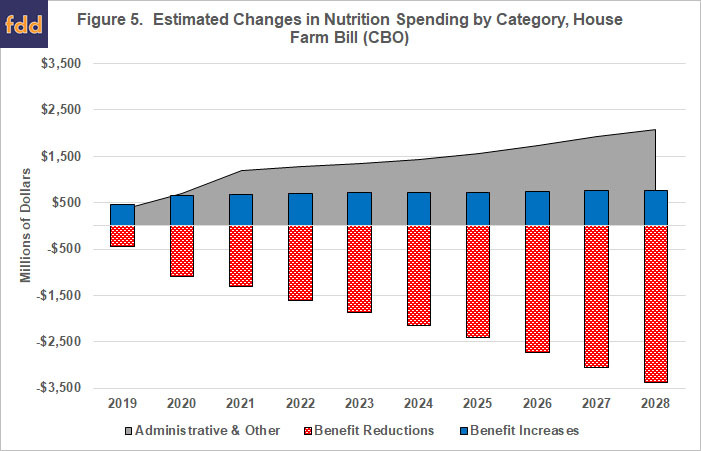 Overall, CBO estimates that the bill would increase spending on nutrition title programs by $463 million over the 10-year budget window. Most of the controversy, however, is due to the changes made to eligibility requirements, allowances for energy assistance and creation of new work requirements. The expected impacts of these changes are evident in the CBO score. In total, CBO scored 23 different changes to the nutrition title programs, including SNAP. 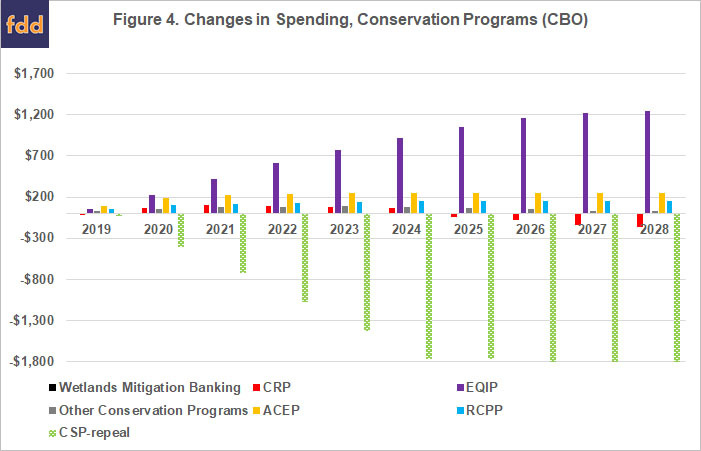 Figure 5 illustrates these by sorting CBO’s estimated changes in spending into one of three categories: (1) those that reduce spending on benefits, including through reduced participation; (2) those that increase spending on benefits; and (3) those that add or increase spending on administrative or other non-benefit matters. The House farm bill creates a National Animal Disease Preparedness and Response fund for $450 million and increases spending on international development programs (e.g., Market Access Program and Foreign Market Development program) for creating and expanding export markets for American commodities by $450 million. It also increases funding for outreach and assistance to socially disadvantaged producers, organic research and extension, as well as for beginning farmer and rancher development. The bill creates a trust fund for cotton and wool apparel articles at a cost of over $100 million. Finally, the House farm bill eliminates the energy title that was first created by the 2002 Farm Bill but the energy programs are continued under the Rural Development title (Title VI). Mandatory funding for these programs has been eliminated and the programs would be subject to appropriations. According to CBO, this results in a reduction in spending on biorefinery assistance and the Rural Energy for America Program (REAP) by just over $500 million in the 10-year window. Historically, farm bills have been a political contest more regional than partisan but this began to transform as southern states and districts transitioned from the Democratic Party to the Republican Party (Coppess 2018). The debate that produced the Agricultural Act of 2014 highlighted the political problems for farm bills under this partisan and regional realignment; the Senate featured a traditional regional contest over farm programs and the House a contentious partisan dispute over SNAP. It is notable that the Senate managed to pass a bill twice on bipartisan votes but the House initially defeated the bill on the floor. With the Agriculture and Nutrition Act of 2018, the farm bill political situation continues to deteriorate. The vote last week marks the first time since food assistance was added to farm bills that one was reported by the House Ag Committee on a strictly party-line vote. The closest historical antecedent was the Food and Agriculture Act of 1962 that was opposed by all 14 Republicans on the House Ag Committee and a handful of Democrats. That bill was defeated on the House floor. Coppess, J., G. Schnitkey, C. Zulauf, and N. Paulson. 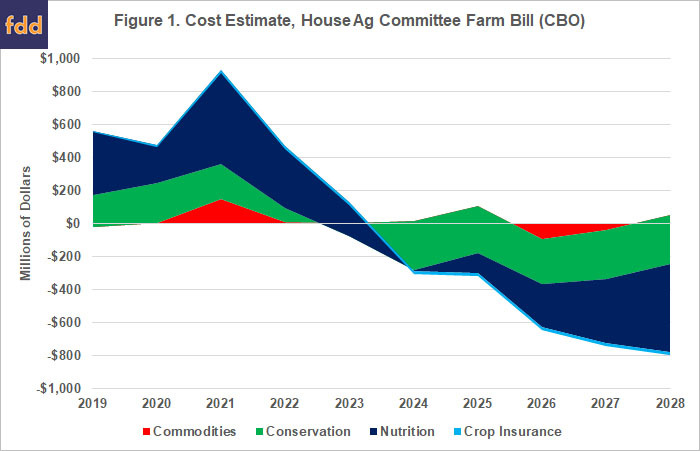 "Reviewing the CBO Baseline for 2018 Farm Bill Debate." farmdoc daily (8):65, Department of Agricultural and Consumer Economics, University of Illinois at Urbana-Champaign, April 12, 2018. Have Soybean Yields Increased Relative to Corn Yields in Recent Years?